With simple clear buttons to guide you to the information you want to use and notes to prompt you what needs attention. Simply click on the notes to see the details of the reminders, everything about this software is simple. 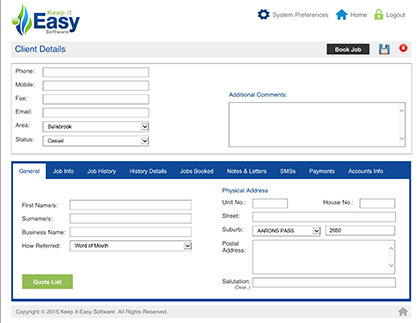 You can see everything about that client, all in the one screen, their default job information, history, bookings, notes, letters, sms, payments, account information and comments, as well as being able to email, sms, send them a letter or book them a job from this screen also. 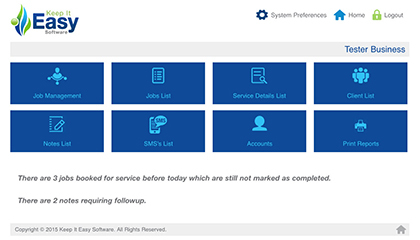 Just like a telephone book click A to Z to list just those clients, or use the easy search boxes at the top of each column to search. 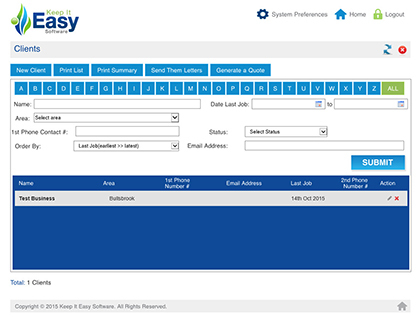 Standard search screens make the software simple to use. 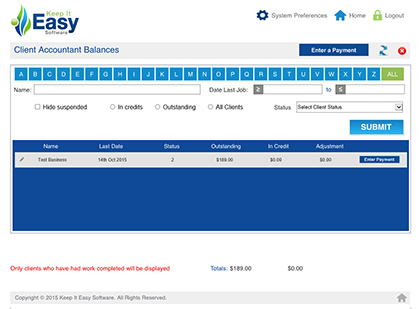 Quickly view and search all your clients and their financial status with you, in credit, in debt or zero balance, all in one screen.